Iranian poet and filmmaker Baktash Abtin has been sentenced and fined in Iran for posting a photo to his Instagram account of a man who was assaulted by police. 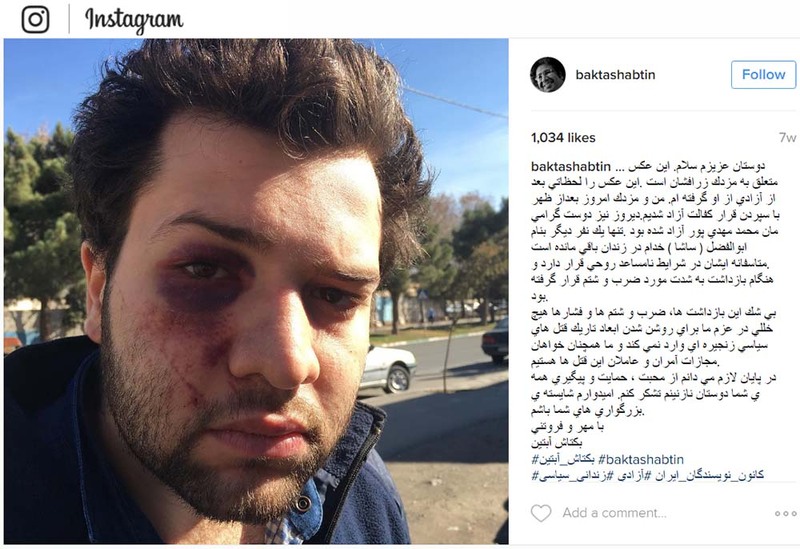 Posting a photo of a man injured by police to his Instagram account has cost Iranian poet and filmmaker Baktash Abtin three months of community service at the State Welfare Organization of Iran and five million tomans ($1,182 USD). A Revolutionary Court in Karaj, west of Tehran, ruled that Abtin, a member of the persecuted Iranian Writers Association, committed “propaganda against the state” when he published a photo of Mazdak Zarafshan with a bruised eye caused by an attack by police on December 2, 2016, when they tried to violently shut down a memorial service for Iranian authors who were murdered in 1998. 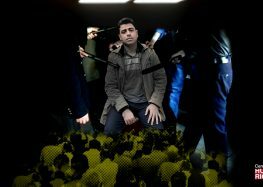 Mazdak Zarafshan is the son of Nasser Zarafshan, an attorney who served five years in prison in Iran for representing the families of dissidents murdered in the 1990s in what came to be known as the chain murders. Batktash said the court originally sentenced him to a year in prison but later ruled that he should do community service and pay a fine instead. He is also facing three more court cases on national security charges, including a trial on June 12, 2018, for allegedly assaulting a policeman. Another ongoing case against Abtin dates back to 2013 when the Culture and Media Court charged him and his colleague Reza Khandan Mahabadi with “propaganda against the state” for publishing IWA newsletters and flyers. In 1998, writer Majid Sharif, opposition politician Dariush Forouhar, his wife Parvaneh Eskandari and writers Mohammad Mokhtari and Mohammad Jafar Pouyandeh—all IWA members—were murdered in cold blood.